Interested in keeping up with the headlines and newspapers? An Internet system called RSS or Atom lets you do it easily. Websites provide "feeds" of their latest stories and headlines, and you can get these simple lists, updated every few minutes. If you want to know more about a story you can go straight to its webpage on its website and read it. No navigating difficult website and trying to spot what's changed! RSS News Reader is free. You can get it from the link below. You have to run the MSI file that you get from the link, and everything will be installed for you. You will then have a desktop shortcut called "RSS News Reader" you can use to start the program. You can also find "RSS News Reader" in your Start menu. You may also need to install the Microsoft .NET 4 Client Framework - I'll upload a proper installer soon. 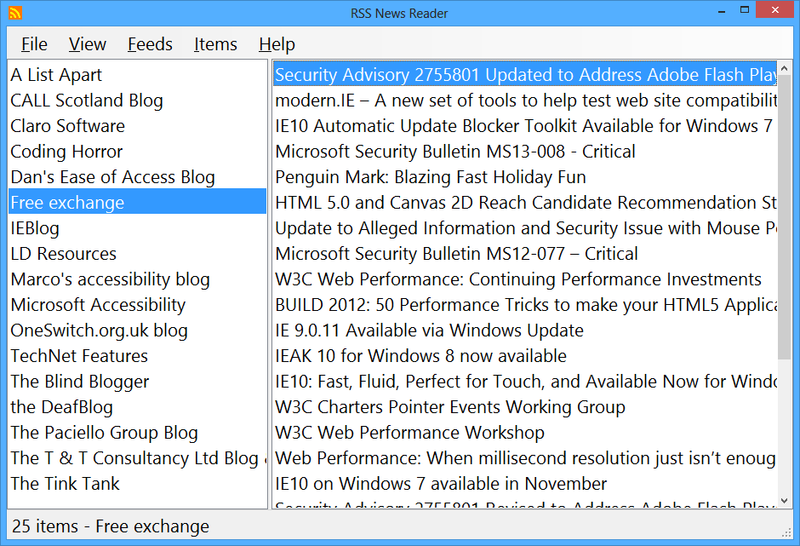 Installer for RSS News Reader Run this Windows Installer file to install RSS News Reader. Easy to use, just cursor up and down your chosen feeds, press enter, and cursor up and down the items. A handy note plays if you reach the end of a list. No mouse required. Supports RSS, all flavours, and Atom feeds. Handles (very common) broken and invalid feeds so you always see the feed come up. Add your own feeds so just the news and websites you want are there. Feed autodiscovery is also supported, so you just need the website address of your favourite site. Feed list is automatically sorted into alphabetical order so you can access the feed you want quickly. Items are shown in date order so you don't get confused. Hide or show read items with a keystroke so you know just what's new. Save and load industry-standard OPML files so you can share your feeds or distribute them to other people or use someone else's collection of feeds. It uses big, clear 16pt text so people with a little sight can use it without needing a screenreader at all. The Microsoft .Net Framework 4 Client Version is required, but the installer should take care of all of that for you. Fixed lots of bugs with updating/getting settings confused. As a consequence, no longer automatically gets the unread counts automatically - you have to go into each feed. When you add a feed it is automatically selected. Now runs on machines with .Net 3.5 or .Net 4.0. Fixed importing OPML files with hierarchies. Fixed importing OPML files in older alternative format. Fixed program being unresponsive when you select a feed - now it will load the feed straightway, or tell you if it can't. Fixed sorting and removing duplicates from the feed list. Fixed the Daily Mail feed. Fixed activation process. Big rewrite. Added a new "Delete All Items" menu item. The program shows the unread item counts in the feed list. And the program doesn't hang when it's communicating with the Internet, so it all works more smoothly. Bugfix: opens web browser for items correctly. I use it every day, every morning when I open my computer around six o'clock in the morning, I read my newspapers, like the Guardian and Daily Mail. It's awesome.